The Talensi Disrict is located in the environmentally fragile, dryland area of northern Ghana. 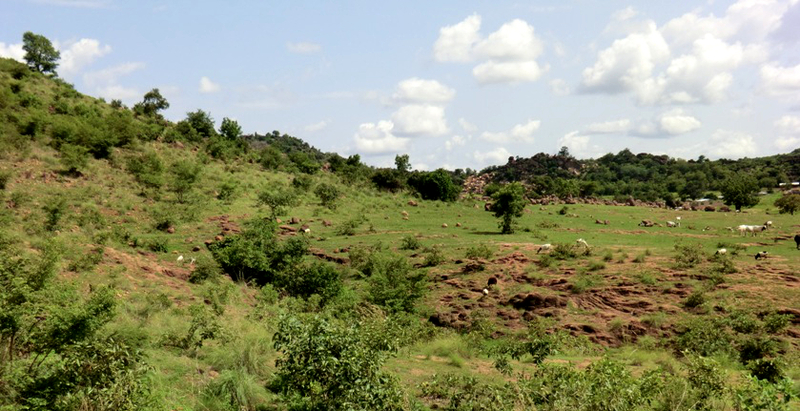 Vulnerability to food crises and climate change, exacerbated by population growth, has diminished livelihood security and quality of life in the Talensi District. Over recent decades, annual rainfall volumes have declined, forest cover and associated indigenous biodiversity have disappeared and arable soils have lost fertility. The results are region-wide food shortages and a population that increasingly struggles to meet its needs. The Talensi farmer-managed natural regeneration (FMNR) project was a pioneering collaboration between World Vision Australia and World Vision Ghana implemented in the Talensi Area Development Program over a three-year period, commencing in July 2009. In the long-term, the project aimed to improve the livelihoods of people in the Talensi Area Development Program by increasing income levels and the number of households with food all year round. In order to achieve this goal, the project encouraged farmers to adopt sound natural resource management (NRM) practices. These practices aimed to rebuild household resilience by reversing losses in forest cover, indigenous biodiversity and soil fertility. Primarily, the project promoted community mobilisation around FMNR to restore multi-purpose indigenous trees to farmland and community-managed forests. FMNR encourages farmers to identify regrowth from the stumps of cut-down trees and to protect and prune the regrowth into new trees. providing training for the adoption of fuel-efficient wood stoves. 46 percent of FMNR adopters observed that FMNR practices generate more wild fruits and food (fruits, nuts, rabbits and partridges). Without FMNR practices, only 4.5 percent believed wild food availability would increase. FMNR households gather, on average, 50 percent of all firewood from forests, compared to 67 percent for non-FMNR households. FMNR households gather, on average, 17 percent of all rafters from their own fields, compared to 70 percent for non-FMNR households. The recovered forest areas provide better access to herbal medicines, in terms of both availability and proximity. The FMNR regrowth trees have some reported effect on protecting fields from severe wind storms, and the additional young trees serve as emergency supplies to repair damaged houses. Slowing wind speeds around human habitations as a result of fire suppression allows grass to be retained in fields and leaves on trees. The project created avenues for people to work together to achieve common goals in ways that were not experienced previously. Community unity is now extending from collaboration on organised activities to cooperation on one another’s farmland. Better shade, beauty and comfort of the community’s surroundings ranked as the fourth most frequent response to an open-ended question asking what respondents thought was the greatest benefit of the project. Children and adults now have an increased sense of optimism for the future of their farming and their communities’ survival. Due to the local availability of fodder, boys are less likely to be removed from school to herd cattle to pastures. Increased access to natural resources has led to the diversification of income and savings, as people do not have to purchase as many natural resources as they did previously. Asset creation (trees): In Ghanaian Cedi (GHS) a rafter, hewn from a tree trunk of a young tree, is worth around GHS4 (US$2.13). Thus, even in the short-term, the additional 393,410 FMNR trees have created assets worth GHS1,573,640 (US$838,750), excluding the value of the trees’ products, such as fruit, nuts and seeds.